2nd Generation Think City shrugs off its Ford patronage and goes it alone, actually offering its cars for sale rather than for lease only from late 2008 at prices starting at £14,000. Revealed at the 2008 Geneva Motor Show this month by Norwegian electric vehicle pioneers Think, a company with 17 years experience in EVs, the new TH!NK city will be available for customer orders during the last quarter of 2008. 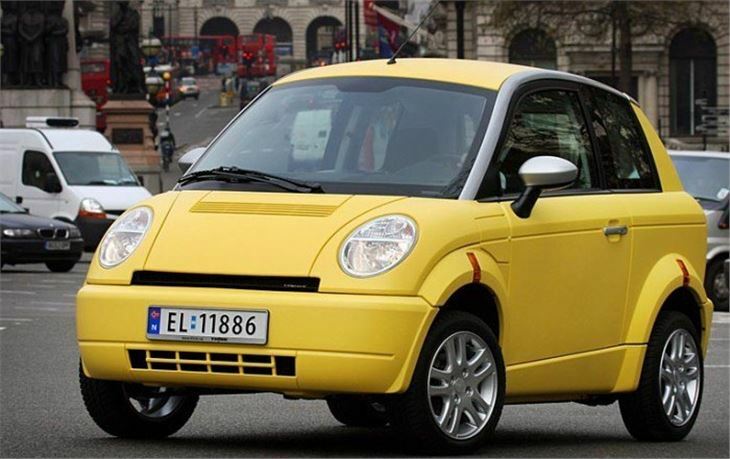 TH!NK city is a true, modern urban car, not a quadricycle. It is a fully environmental vehicle, emission free and 95 percent recyclable. With an energy efficiency three times that of a traditional combustion engine car, it is a car that realistically meets the growing challenges of environmental protection and congestion and emissions legislation. The two seater urban car has a top speed of 65 miles per hour. It accelerates from zero to 30 mph in just 6.5 seconds and 50 mph in 16 seconds. It requires just an overnight top-up of electricity and can travel for 124 miles in city driving on a fully charged battery. A full charge from a domestic electricity socket takes just ten hours. Over 10,000 miles use, the total cost of electricity used to power a TH!NK city will be in the region of £125. TH!NK city is designed to meet the strict safety requirements of both Europe and the US, as a highway-safe road car. The car is equipped with ABS brakes, airbags and three-point safety belts with pretensioners and it meets all European and US requirements with good margins. “Unlike the lower-range, electric quadricycles that have had limited success in the UK, TH!NK city is a real car which provides a realistic option for those motorists who want to drive a true zero emissions car,” said Richard Blundell, Managing Director of Think UK. “Also, concern for the environment has been at the heart of the development of TH!NK city. It’s not only environmentally sound to drive, but the car itself is designed to be recycled,” he added. Engineers, developers, buyers and designers in the company have focused on utilising clean recyclable materials, non-polluting production processes. The dashboard can be completely recycled. The fabric, body, supports, air ducts, adhesives and fixings are designed using the same recyclable materials. TH!NK city’s body is made of recyclable ABS plastic, designed specifically for city driving. Not only is it ideal for motorists want to avoid visible scratches and irritating dents, the unpainted plastic bodywork also reduces both energy consumption and toxins, while also making the panels easier to recycle. The batteries are returned to the supplier at the end of their useable life. Production started in autumn 2007 and the first batch of cars will be delivered to Norwegian customers this spring with orders for UK cars being taken in the last quarter of this year. The expected retail price of TH!NK city is £14,000. The first prototype predecessor to today’s modern TH!NK city was developed in 1991. Drawing on 17 years of experience in electric vehicle development and production, Think is not a typical car industry start-up. TH!NK city was put in serial production in 1999, supported by American car giant Ford. Ford became a major shareholder and invested USD 150 million in Think during its four years as an owner. When Ford decided to leave the electric vehicle sector in 2003, Think was sold out of the car manufacturing group. Though struggling to survive, Think has always retained the basic infrastructure and acquired considerable competence from its American owners. During recent years, a wave of environmentalist conscience and climate change awareness has ripened the market for alternative mobility solutions. In 2006, Norwegian investors bought Think, and an experienced management team entered the scene. Both new and former staff members were added to the team, and a new strategy was outlined for the company. Further share issues during 2007 have prepared Think to go into regular serial production of the 5th generation TH!NK city. The car company of the 21st century is on the road. “We are the car company of the 21st century. We develop zero emission vehicles and sustainable solutions and we are proud to be launching TH!NK city in new markets in 2008 and 2009, something that shows that the demand for sustainable solutions and zero emission vehicles is greater than ever before,” says Jan-Olaf Willums, CEO of Think Global. By July 2008, crash-tested and highway-certified. Top speed of 65 mph and an in-town range of 126 miles on a full charge. Costs £100 in electricity to cover 10,000 miles with no road tax and no congestion charge. 95 per cent recyclable. Available in the UK from Summer 2009. Accelerates from zero to 30 mph in just 6.5 seconds and to 50 mph in 16 seconds. It requires just an overnight top-up of electricity and can travel for 126 miles in city driving on a fully charged battery. Production started in 2008 in Norway, and the first batch of right-hand drive cars will be delivered to UK customers in summer 2009. Prices of the TH!NK city will be announced closer to the on-sale date. 20-3-2009:- Amsterdam/Oslo: Electric vehicle manufacturer Think has signed a Memorandum of Understanding (MOU) to deliver up to 500 TH!NK city electric-powered vehicles this year to ElmoNet, a subsidiary of Mobility Service Netherlands. With the Dutch Parliament calling for the rapid introduction of EVs (electric vehicles), the Minister of Transport, Mr. Camiel Eurlings, earlier this year announced a fund of 10 million Euros to be made available to support the large scale, early introduction of electric mobility. “Ambitious visions and concrete measures are required to make the Netherlands the most important experimental garden for electric mobility” says Marjan Minnesma, Director of Urgenda. Urgenda is an active foundation that aims to transform the Netherlands into a model for sustainable development. TH!NK city is a modern, two seater urban car which has a top speed of 100 km/h (65 mph). It accelerates from zero to 50 km/h (30 mph) in just 6.5 seconds and 80 km/h (50 mph) in 16 seconds. With zero local emissions and an energy efficiency three times that of a traditional combustion engine car, it is a car for the environment. It can travel for 180 km (112 miles) in city driving on a fully charged battery. The Cities of Amsterdam and Rotterdam have already expressed keen interest to introduce the TH!NK city electric car in their region. Think delivered the first TH!NK city EVs to ElmoNet in February, and will continue to deliver vehicles according to the MOU in 2009.